Citigroup Inc. today reported net income for the fourth quarter 2018 of $4.3 billion, or $1.64 per diluted share, on revenues of $17.1 billion. This compared to a net loss of $18.9 billion, or $7.38 per diluted share, on revenues of $17.5 billion for the fourth quarter 2017. Fourth quarter 2017 included a one-time, non-cash charge of $22.6 billion, or $8.66 per share, recorded in the tax line related to the enactment of the Tax Cuts and Jobs Act (Tax Reform). Fourth quarter 2018 included a one-time benefit of $94 million, or $0.03 per share, recorded in the tax line in Corporate / Other, due to the finalization of the provisional component of the impact based on Citi�s analysis as well as additional guidance received from the U.S. Treasury Department related to Tax Reform. Excluding the one-time impact of Tax Reform in both the current and the prior-year periods, net income of $4.2 billion increased 14%, primarily driven by a reduction in expenses, lower cost of credit and a lower effective tax rate, partially offset by lower revenues. On this basis, earnings per share of $1.61 increased 26% from $1.28 per diluted share in the prior-year period, driven by the growth in net income and an 8% reduction in average diluted shares outstanding. 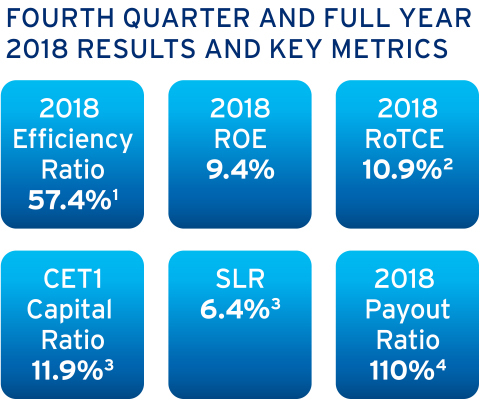 Citi CEO Michael Corbat said, �We made solid progress throughout 2018 towards our longer-term financial targets, ending the year with an RoTCE of 10.9% and an efficiency ratio of 57%. Our institutional and consumer franchises each grew revenue on a full year basis and we continued to invest in our people and technology in order to better serve our clients. During the year, we also grew loans and deposits, improved ROA, and carefully managed both our expenses and balance sheet. We also returned more than $18 billion of capital to common shareholders. �A volatile fourth quarter impacted some of our market sensitive businesses, particularly Fixed Income. However, our ICG accrual businesses � Treasury and Trade Solutions, Securities Services, Private Bank and Corporate Lending � continued their strong performance. And in Global Consumer Banking, we had good underlying growth in U.S. Branded Cards and solid performance from our franchise in Mexico where we have been investing. For 2019, we remain committed to delivering a 12% RoTCE and continuing to improve our operating efficiency during the year,� Mr. Corbat concluded. For the full year 2018, Citigroup reported net income of $18.0 billion on revenues of $72.9 billion, compared to a net loss of $6.8 billion on revenues of $72.4 billion for the full year 2017. Excluding the one-time impact of Tax Reform, Citigroup net income of $18.0 billion increased 14% compared to the prior year. Throughout the remainder of this press release, net income and Citigroup�s effective tax rate are presented on a reported and adjusted basis, excluding the one-time impact of Tax Reform in both the current and prior year periods. For additional information on these adjustments as well as other non-GAAP financial measures used in this press release, see the Appendices and Footnotes to this release. Percentage comparisons throughout this press release are calculated for the fourth quarter 2018 versus the fourth quarter 2017, unless otherwise specified. (b) Excludes the impact of Tax Reform in 4Q'18, 4Q'17, full year 2018 and full year 2017. For additional information, please refer to Appendix A and Footnote 5. Citigroup revenues of $17.1 billion in the fourth quarter 2018 decreased 2%, primarily reflecting lower revenues in Fixed Income Markets within the Institutional Clients Group (ICG), as well as the wind-down of legacy assets in Corporate / Other. Citigroup operating expenses of $9.9 billion in the fourth quarter 2018 decreased 4%, driven by lower compensation costs, efficiency savings and the wind-down of legacy assets, partially offset by investments and volume growth. Citigroup cost of credit in the fourth quarter 2018 was $1.9 billion, a 7% decrease, primarily driven by an episodic charge-off in ICG in the prior-year period. Citigroup net income increased to $4.2 billion in the fourth quarter 2018, excluding the impact of Tax Reform, primarily driven by the lower expenses and cost of credit as well as the lower effective tax rate, partially offset by the decrease in revenues. Including the impact of Tax Reform, Citigroup�s effective tax rate was 19% in the current quarter and was not meaningful in the fourth quarter 2017. Excluding the impact of Tax Reform, Citigroup�s effective tax rate was 21% in the current quarter compared to 25% in the fourth quarter 2017. Citigroup�s allowance for loan losses was $12.3 billion at quarter end, or 1.81% of total loans, compared to $12.4 billion, or 1.86% of total loans, at the end of the prior-year period. Total non-accrual assets declined 24% from the prior-year period to $3.6 billion. Consumer non-accrual loans declined 17% to 2.2 billion and corporate non-accrual loans decreased 32% to $1.3 billion. Citigroup�s end-of-period loans were $684 billion as of quarter end, up 3% from the prior-year period. Excluding the impact of foreign exchange translation7, Citigroup�s end-of-period loans grew 4%, as 5% aggregate growth in ICG and Global Consumer Banking (GCB) was partially offset by the continued wind-down of legacy assets in Corporate / Other. Citigroup�s end-of-period deposits were $1.0 trillion as of quarter end, an increase of 6% from the prior-year period. Excluding the impact of foreign exchange translation, Citigroup�s end-of-period deposits grew 7%, driven by 10% growth in ICG. Citigroup�s book value per share of $75.05 and tangible book value per share of $63.79, both as of quarter end, increased 6% from the prior-year period driven by the benefit of a lower share count. At quarter end, Citigroup�s CET1 Capital ratio was 11.9%, up from 11.7% in the prior quarter, driven by a reduction in risk-weighted assets. Citigroup�s SLR for the fourth quarter 2018 was 6.4%, down from 6.5% in the prior quarter. During the fourth quarter 2018, Citigroup repurchased 74 million common shares and returned a total of $5.8 billion to common shareholders in the form of common share repurchases and dividends. (d) Excludes the impact of Tax Reform in 4Q'17 and full year 2017. For additional information, please refer to Appendix A and Footnote 5. GCB revenues of $8.4 billion remained largely unchanged on a reported basis and increased 1% in constant dollars, driven primarily by growth in North America GCB and Latin America GCB, partially offset by a decline in Asia GCB. North America GCB revenues of $5.3 billion increased 1%, as higher revenues in Citi Retail Services more than offset lower revenues in Retail Banking, as Citi-Branded Cards remained largely unchanged. Retail Banking revenues of $1.3 billion decreased 1%. Excluding mortgage, Retail Banking revenues increased 5%, driven by continued growth in deposit spreads, partially offset by lower deposit volumes. Citi-Branded Cards revenues of $2.2 billion remained largely unchanged, as growth in interest-earning balances was offset by the impact of the Hilton portfolio sale as well as the previously disclosed partnership terms. Citi Retail Services revenues of $1.7 billion increased 6%, primarily reflecting organic loan growth and the benefit of the L.L.Bean portfolio acquisition. Latin America GCB revenues of $1.4 billion remained largely unchanged. In constant dollars, revenues increased 5%, or 7% excluding revenues associated with an asset management business in Mexico that was sold in the third quarter 2018. On this basis, retail banking revenues grew 6%, excluding the impact of the asset management sale, driven by deposit growth, as well as improved deposit spreads. Cards revenues grew 8%, driven by growth in purchase sales and loans. Asia GCB revenues decreased 4% to $1.8 billion. In constant dollars, revenues increased 1%, excluding a modest gain on sale of a merchant acquiring business in the prior-year period. On this basis, retail banking revenues declined 1%, reflecting lower investment revenues, while cards revenues grew 3%, excluding the gain, driven by growth in loans and purchase sales. GCB operating expenses of $4.6 billion increased 1%. In constant dollars, expenses increased 2%, as investments and volume-related expenses were partially offset by efficiency savings. GCB cost of credit of $1.8 billion was largely unchanged. In constant dollars, cost of credit increased 1%, driven by an 8% increase in net credit losses, primarily reflecting volume growth and seasoning in Citi-Branded Cards and Citi Retail Services in North America GCB. GCB net income of $1.5 billion increased 14% on a reported basis and 16% in constant dollars, excluding the impact of Tax Reform, driven primarily by the lower effective tax rate. (a) Excludes gain / (loss) on credit derivatives as well as the mark-to-market on loans at fair value. For additional information, please refer to Footnote 8. ICG revenues of $8.2 billion decreased 1%, as a decline in Markets and Securities Services more than offset growth in Banking. Banking revenues of $5.1 billion increased 6% (including gain / (loss) on loan hedges)8, as continued growth across businesses more than offset a decline in Investment Banking. Treasury and Trade Solutions revenues of $2.4 billion increased 7% on a reported basis and 11% in constant dollars, reflecting continued growth in transaction volumes and deposits, as well as improved spreads. Investment Banking revenues of $1.3 billion decreased 1% versus the prior-year period, as strong growth in advisory was more than offset by a decline in underwriting fees, reflecting lower market activity. Advisory revenues increased 47% to $463 million, equity underwriting revenues decreased 28% to $181 million and debt underwriting revenues decreased 13% to $634 million. Private Bank revenues increased 3% to $797 million, driven by growth in loans and investments, as well as improved deposit spreads. Corporate Lending revenues of $559 million increased 9% (excluding gain / (loss) on loan hedges), reflecting loan growth as well as lower hedging costs. Markets and Securities Services revenues of $3.1 billion decreased 11%, as weakness in Fixed Income Markets more than offset growth in Securities Services and Equity Markets. Fixed Income Markets revenues of $1.9 billion in the fourth quarter 2018 decreased 21%, reflecting a challenging trading environment characterized by volatile market conditions and widening credit spreads, particularly in December. Equity Markets revenues of $668 million increased 18%, reflecting the absence of an episodic loss incurred in the prior-year period. Securities Services revenues of $653 million increased 7% on a reported basis and 12% in constant dollars, driven by continued growth in client volumes and higher net interest revenue. ICG net income of $2.5 billion increased 14%, excluding the impact of Tax Reform, driven primarily by the lower effective tax rate, as well as lower cost of credit and expenses which more than offset the lower revenues. ICG operating expenses decreased 2% to $4.8 billion, primarily driven by a decrease in performance-based compensation. ICG cost of credit of $129 million decreased 52%, primarily driven by the absence of an episodic charge-off incurred in the prior-year period. Corporate / Other revenues of $470 million decreased 37% from the prior-year period, driven by the wind-down of legacy assets. Corporate / Other expenses of $473 million decreased 45% from the prior-year period, driven by the wind-down of legacy assets and lower infrastructure costs. Corporate / Other income from continuing operations before taxes of $44 million increased from a loss of $61 million in the prior-year period, as the lower expenses more than offset the lower revenues. Citigroup will host a conference call today at 10:00 AM (ET). A live webcast of the presentation, as well as financial results and presentation materials, will be available at https://www.citigroup.com/citi/investor . Dial-in numbers for the conference call are as follows: (866) 516-9582 in the U.S. and Canada; (973) 409-9210 outside of the U.S. and Canada. The conference code for both numbers is 4793298. Additional financial, statistical and business-related information, as well as business and segment trends, is included in a Quarterly Financial Data Supplement. Both this earnings release and Citigroup�s Fourth Quarter 2018 Quarterly Financial Data Supplement are available on Citigroup�s website at www.citigroup.com . Certain statements in this release are �forward-looking statements� within the meaning of the rules and regulations of the U.S. Securities and Exchange Commission (SEC). These statements are based on management�s current expectations and are subject to uncertainty and changes in circumstances. These statements are not guarantees of future results or occurrences. Actual results and capital and other financial condition may differ materially from those included in these statements due to a variety of factors, including, among others, the efficacy of Citi�s business strategies and execution of those strategies, such as those relating to its key investment, efficiency and capital optimization initiatives, governmental and regulatory actions or approvals, various geopolitical and macroeconomic uncertainties, challenges and conditions, for example, changes in monetary policies and trade policies, and the precautionary statements included in this release and those contained in Citigroup�s filings with the SEC, including without limitation the �Risk Factors� section of Citigroup�s 2017 Form 10-K. Any forward-looking statements made by or on behalf of Citigroup speak only as to the date they are made, and Citi does not undertake to update forward-looking statements to reflect the impact of circumstances or events that arise after the date the forward-looking statements were made. (4) The cumulative impact of changes in Citigroup�s own creditworthiness in valuing liabilities for which the fair value option has been elected, and own-credit valuation adjustments on derivatives, are excluded from Common Equity Tier 1 Capital, in accordance with the U.S. Basel III rules. (5) Includes goodwill �embedded� in the valuation of significant common stock investments in unconsolidated financial institutions. (2) Additional Tier 1 Capital primarily includes qualifying noncumulative perpetual preferred stock and qualifying trust preferred securities. 1 Citigroup�s total expenses divided by total revenues. 2 Preliminary. Citigroup�s return on average tangible common equity (RoTCE) is a non-GAAP financial measure. RoTCE represents annualized net income available to common shareholders as a percentage of average tangible common equity (TCE). Citigroup�s 2018 RoTCE of 10.9% excludes the one-time impact of Tax Reform in 4Q�18. For the components of the calculation, see Appendix A. 3 Ratios as of December 31, 2018 are preliminary. Citigroup�s Common Equity Tier 1 (CET1) Capital ratio and Supplementary Leverage Ratio (SLR) reflect full implementation of the U.S. Basel III rules for all periods. As of December 31, 2017, these ratios are non-GAAP financial measures, which reflect full implementation of regulatory capital adjustments and deductions prior to the effective date of January 1, 2018. For the composition of Citigroup�s CET1 Capital and ratio, see Appendix C. For the composition of Citigroup�s SLR, see Appendix D.
4 Citigroup�s payout ratio is the sum of common dividends and common share repurchases divided by net income available to common shareholders. Citigroup�s 2018 payout ratio of 110% excludes the one-time impact of Tax Reform in 4Q�18. For the components of the calculation, see Appendix A. 5 Represents the fourth quarter 2017 and full year 2017 one-time impact of the enactment of the Tax Cuts and Jobs Act (Tax Reform), which was signed into law on December 22, 2017, as well as the fourth quarter 2018 and full year 2018 one-time impact of the finalization of the provisional component of the impact based on Citi�s analysis as well as additional guidance received from the U.S. Treasury Department related to Tax Reform. For the components of the calculation, see Appendix A. 6 Citigroup�s tangible book value per share is a non-GAAP financial measure. For a reconciliation of this measure to reported results, see Appendix E.
7 Results of operations excluding the impact of foreign exchange translation (constant dollar basis) are non-GAAP financial measures. For a reconciliation of these measures to reported results, see Appendices A and B. 8 Credit derivatives are used to economically hedge a portion of the corporate loan portfolio that includes both accrual loans and loans at fair value. Gains / (losses) on loan hedges includes the mark-to-market on the credit derivatives and the mark-to-market on the loans in the portfolio that are at fair value. The fixed premium costs of these hedges are netted against the corporate lending revenues to reflect the cost of credit protection. Citigroup�s results of operations excluding the impact of gains / (losses) on loan hedges are non-GAAP financial measures.